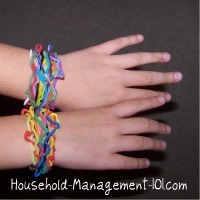 Silly bandz bracelets (also commonly spelled silly bands) are an obsession with some kids, but can also just be good clean fun. Find out more about how to keep it fun with this little toy. If you aren't familiar with what these little plastic bracelets are, and you have young kids, count yourself lucky because your kids aren't currently trying to collect them. Otherwise, you would have heard more about them than you could possibly imagine. Whoever invented these things is both a genius, and I'm sure by now, totally rich since almost every kid I know has several of these bracelets that bounce back into a specific shape when you take them off. 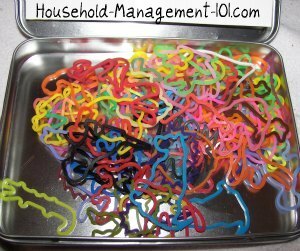 Silly bands are, of course, completely unnecessary. Obviously your child doesn't need them to survive. Further, silly bands can cause disruptions in school learning when kids are so obsessed with trying to trade them that they don't pay attention to their lessons. Finally, at least in my kids' school silly bandz have brought out the mean streak in some kids. These little bracelets are pretty flimsy, and can snap easily. You can no longer trade them in the hallways at my kids' school because older kids were tricking some of the little kindergarteners into trading with them, and the older kid ended up with a good silly band, and the younger one ended up with a broken one. 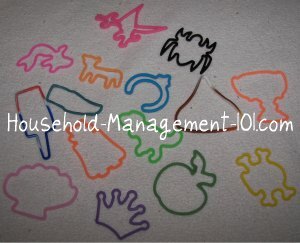 Despite the bad things about silly bands discussed above, my husband and I have chosen not to completely ban them in our home, but instead to treat them as a learning experience. Let's face it, kids are going to encounter similar problems with other items besides these little bracelets as they get older anyway, because unfortunately the problems encountered because of them are just inherent frailties of human nature. Therefore, in our home silly bandz are a privilege, not a right. Several teachers give them away as a reward for good behavior, and similarly they are allowed to choose them as a prize for good behavior in our home, for example, when they get a good report card. Similarly, bad behavior or poor choices can cause them to go away. This seems to help them value them more, because they had to put forth effort and work to get them, and keep them. Further, they are allowed to trade them with their friends only at lunch, recess and on the bus, but can otherwise make their own choices of what to do with them. I think trading is a great skill to learn, to make sure you are fair to the other person, and also get something you value yourself too. I also know that both of my kids have just given some away to their friends, which warms my heart since I know how much they like those list plastic bracelets. Finally, on their own my kids decided to pool their silly band resources together, and keep them in one box (see above). That means as a family they are sharing amongst themselves fully. I love that they have this joint box, to understand the important of family togetherness and cooperation. Basically, any collection can become an obsession. The key, I believe, is to help your child discover the fun in sharing and trading, and realize this is different then just treasuring the objects themselves. These bracelets can be found almost anywhere these days, from grocery stores and discount stores, to card and gift shops. Further, there are the original "Silly Bandz" and there are knock off imitators, and frankly I don't think my kids even know the difference. A plastic bracelet is a plastic bracelet, so just get the shapes or colors they want, or the price you want, and don't worry about the brand. They are a pretty cheap stocking stuffer idea. I have found some good prices for them on Amazon .